Geno Smith broken jaw: Jets quarterback out 6-10 weeks after Ikemefuna Enemkpali punch, reports say. 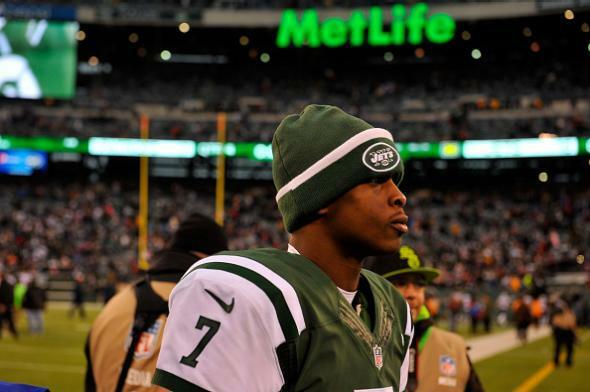 Geno Smith during a game against the Patriots, which the Jets lost, in December 2014. Head coach Todd Bowles announced today that QB Geno Smith will likely be out until October, after he was hit by LB Ikemefuna “I.K.” Enemkpali in a locker-room fight this morning. Bowles used the words “cold-cocked” and “sucker-punched,” and said Enemkpali has been cut. Enemkpali was the Jets’ sixth-round pick in the 2014 draft.